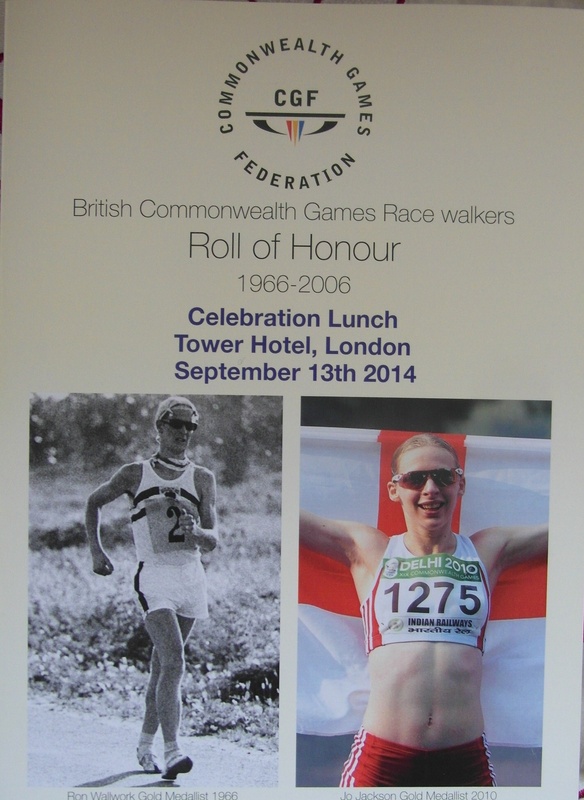 Rob Elliott attended the Commonwealth Games Celebration Lunch held in the Tower Hotel in London last weekend as a guest of the Race Walking Association. The occasion was to honour those from the British Isles that had represented England, Scotland, Wales, Northern Ireland, Isle of Man and Guernsey at the Commonwealth Games since the first walk was held in 1966. A sellout of 140 people gathered together. 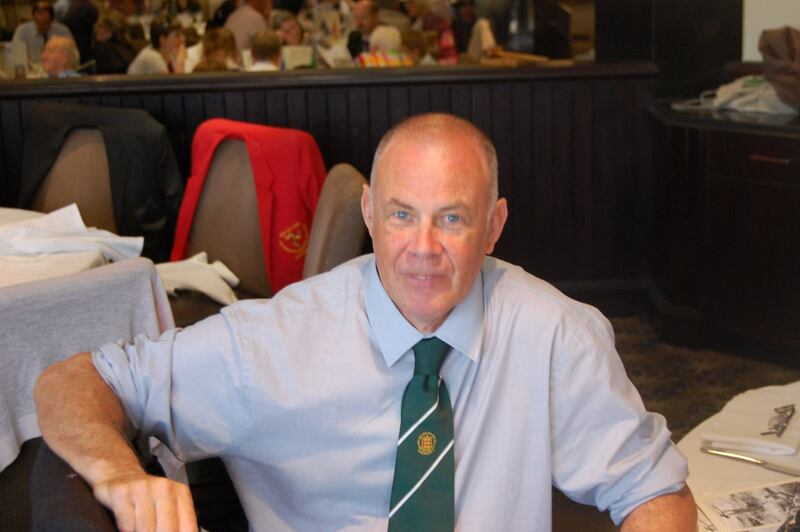 Rob (pictured by rival in the 1982 Brisbane Games, Murray Lambden) had not seen some for almost 30 years, since his Games walk in 1982, with others seen only the week before at the Church to Church Walk! Amongst those present were bronze medalist from 1970 Bill Sutherland who is the Guernsey Allcomers 7 miles record holder from back in the 1960s and a Sarnia Walking Club Life Member and Ray Middleton, silver medalist in 1966 and the 1967 Guernsey West Show winner with a Guernsey Allcomers 20 miles record. Also present were Chris Maddocks as an English Games competitor and Church Record holder and Womens Record holder Cath Duhig (Reader). Dave also mentioned the Sarnia Walking Clubs 50th anniversary as Guernsey was introduced in the proceedings. 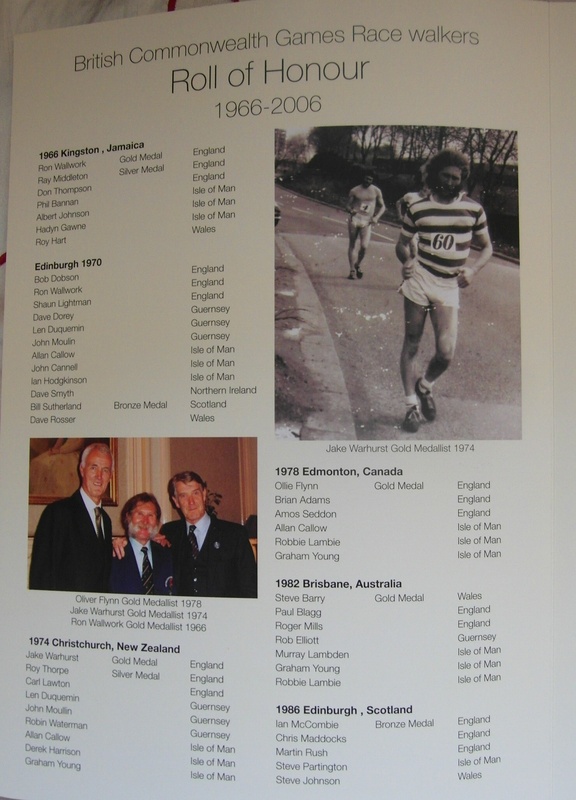 Pictured below are the cover and page relevant to Guernsey competitors at the 1970. 1974 and 1982 walks.